Welcome to The Abso!ute Sound online! We explore music and the reproduction of music in the home. We believe that the sound of music, unamplified, occurring in a real space is a philosophic absolute against which we may judge the performance of devices designed to reproduce music. Our goal is to provide the resources consumers need to judge how a component's sound either honors or departs from the music's truth, and to make sound purchasing decisions that maximize their experience of reproduced sound. Below is our Issue 145, December 2003 / January 2004 table of contents and editorial. Paul Seydor on the background of Sota, and its latest triumph, the Cosmos Series III. 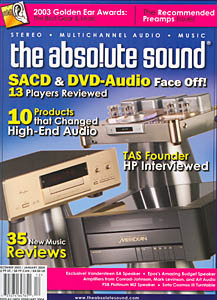 In this special feature on DVD-Audio and SACD, Robert Harley gives a technical primer on the two formats; Bob Stuart of Meridian Audio and David Kawakami of Sony make the case for the respective formats; and on page 97 our staff reviews 13 SACD, DVD-A, and Universal players from Accuphase, Denon, EMM Labs, JVC, Krell, Marantz, Meridian, Musical Fidelity, Philips, Shanling, Sony, and Yamaha. Our annual year-end awards to the very finest components. Classical Music subeditor Andrew Quint journeys to Bayreuth for the ultimate Wagner experience. For this final issue of our 30th Anniversary year, Andrew Quint sat down with HP to chat about this magazine’s beginnings, and the high end today. Chris Martens listens to the latest budget mini from England’s Epos. $1600 for computer sound? You betcha! says Tom Miiller. Neil Gader on this fine new model from Canada’s Paul Barton. C-J stuff is super expensive, right? Not necessarily, as Dan Davis reports. Anthony H. Cordesman on the latest power amp from the Mark Levinson Co.
Stephan Harrell has slimmed way down—to a mere 6 watts of SET bliss. Harry Pearson reflects on the ten most significant audio components of all time. Each of our music writers, giving equal consideration to musical and sonic merits, chooses three of his favorite records released in 2003. Wayne Garcia on the best-selling speaker in high-end audio history.